A gobo created this fireworks image on the wall. Lighting can make a stunning difference in the ambiance of your benefit auction. But if an auction lighting company isn’t in the budget, there might be elements that could be managed by an enthusiastic volunteer. I’m not suggesting it would be easy or ideal, but I’ve no doubt there are some volunteers out there who like to dabble and play. And if I provided an idea what could be done with lighting via this blog post, that might be all of the encouragement you need to get started. So that stated, I want to introduce you to a lighting tool you can consider incorporating into your next auction. 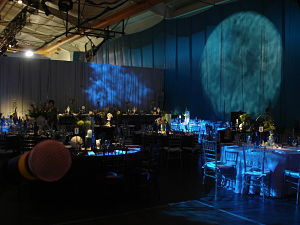 Gobos can be used to add ambiance. To create an underwater world, the lighting company used a large gobo on the left which looked like water, and a small image on the right which looked like (to me) a cluster of three amoebas. Do you know what a gobo is? 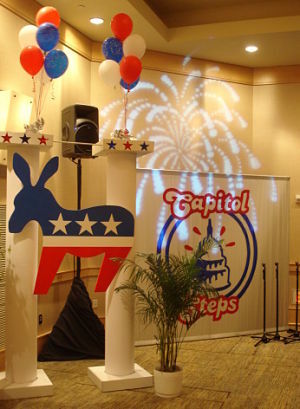 A gobo is a template that is attached to a lighting source in order to project an image onto a wall, floor, ceiling, or – really – even into smoke or the clouds in the sky. The template has a pattern cut into it – like the starburst pattern in the photo …. or an image of a candle … or the profile of a head — which allows the light to be projected into that shape. Another example: As a child, I loved playing with Lite-Brite. A black piece of paper was put over the toy’s light source. I would take colored plastic pegs and push it through the paper to create an image. Wherever the paper was pierced, the light would shine through. Once I pierced enough of the paper, a recognizable image was created. Well, the black paper in the Lite-Brite is sort of like a gobo. A pattern has been cut out of some material — plastic, glass, or metal — to create an image. Once the light source is behind it, the light passes through the gobo and forms an image onto the projected area. The type of material used to create a gobo depends on the type of light used. Obviously if you are using plastic to create your gobo, the light source better not get to hot or it will melt the plastic … or even worse, start a fire. There are hundreds of gobo images available. Maybe thousands! Companies like Stagespot sell stock gobos and create custom ones. When I worked in the corporate world, we had gobos made of our logo so it could be projected around the facility during company events. If you wanted to go super cheap, you could probably ruggedly cut a gobo out of a soda can. I’m not an expert in such matters, and will let you handymen (and women) figure that one out. Gobo lighting is perfect for auction events helping to transform a room. Old lighting technology made the DIY approach difficult in the past. Now with LEDs you can rent a DIY gobo package with shipping for less than most local rentals.